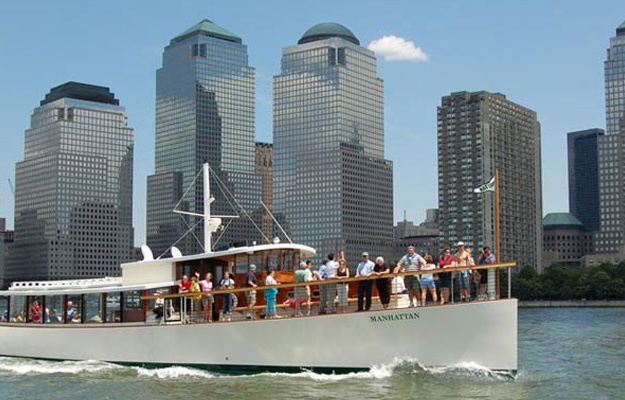 Circle Line’s 2½ hour Best of NYC Cruise is popular with visitors who want to circle the island of Manhattan. 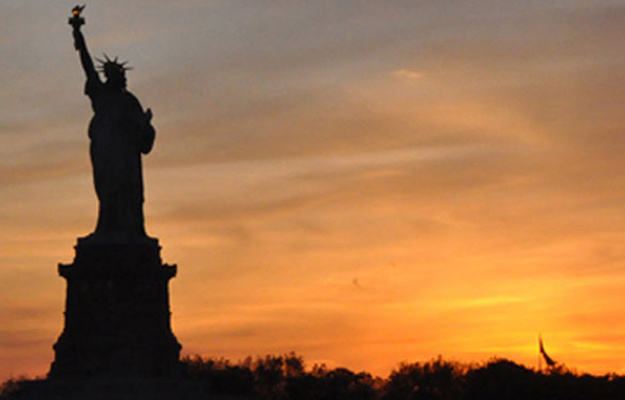 The 1½ hour Landmarks Cruise takes visitors to see spectacular views from the Hudson River and East River. Both tours are on luxury yachts with multi-level outdoor decks and climate-controlled, comfortable interior salons with large viewing windows which accommodate up to 600 people. If you just want to take a trip out to see the Statue of Liberty, Circle Line’s Statue of Liberty Express is a good choice. City Sightseeing’s Ferry Boat Tours aboard a contemporary ferry boat with outdoor decks and climate-controlled interiors, depart on regular schedules throughout the day. The narrated 90-minute tour, hitting all the skyline highlights and going by Lady Liberty too, is reasonably priced. Two hop-on, hop off locations, one at Pier 78 in Midtown Manhattan and the other at the World Financial Center, give visitors the opportunity to get off and explore Manhattan’s neighborhoods. Clipper City Tall Ship’s Daytime Statue Sail is a trip back to the time when tall ships dominated the maritime trade in New York Harbor. Sailing on the replica lumber schooner is an awesome 60-90 minute sail. At 158 feet long, with 5000 square feet of canvas, unfurled as you set sail through the harbor, it’s a great choice for families. Hang out on the spacious main deck or raised quarter deck to enjoy the breezes, spectacular skyline, active harbor and “Lady Liberty” up close. Manhattan Sail’s Daytime Statue Sail aboard the 82-foot luxury schooner, Shearwater, is a close-to-the-water, heeling-over sailing experience. Having to watch your head for the boom coming across, feeling the sailboat heel over, and getting a bit wet with the occasional spray, makes this energizing sail suitable for adults and families with teens. Reserve a seat on a bench, deck-box, or teak deck on one of several daytime options on the beautifully restored 1929 sailing cruiser which carries a max of 49 passengers. For relaxed luxury, SailawayNY’s Daytime Tour is hard to beat. It’s a superlative choice for adults who just want to get away on an elegant sailing yacht sloop. The mixed-group tour, accommodating up to 12 passengers, is a delightful experience. Picture yourself sailing in comfort, watching the dramatic skyline pass by while sipping a cold beer or glass of wine. 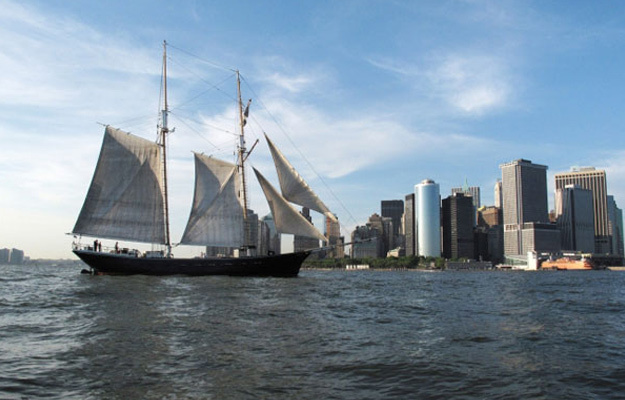 The 1¾ hour sail departs daily at 1 and 3pm from two locations in Lower Manhattan. 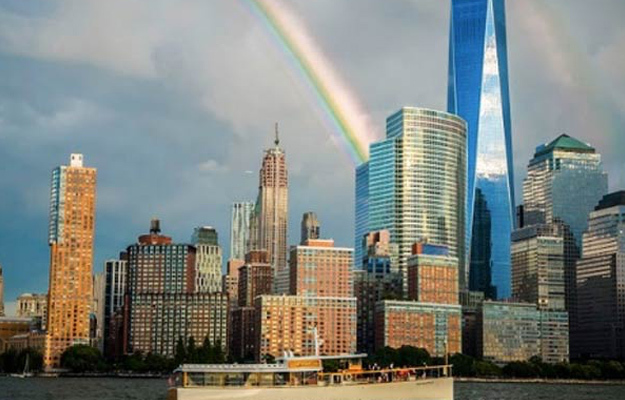 Avid photographers get the best NYC photos on Adventure Sightseeing Tour aboard U.S Navy designed rigid inflatables used by news agencies to cover breaking news. The open-air, close-to-the-water ride puts photo buffs where they need to be for great shots around Manhattan, up close to the Statue of Liberty and under bridges spanning the East River. A low freeboard and sometimes bumpy ride make most suitable for adults. Around Manhattan Architecture Tour is the perfect choice for anyone interested in the architecture. Having a member of American Institute of Architects explain architectural and construction the city’s iconic skyscrapers and distinctive buildings and bridges as the 1920-era elegant yacht circumnavigates the island of Manhattan, is fascinating. The tour departs from Chelsea Piers around 1pm adhering to a specific schedule. Circle Line’s Beast Speedboat Ride’s supercharged ½ hour, 45 mph zoom towards the Statue of Liberty and back on the 70-foot speedboat is a blast for thrill-seekers. A bit of romance goes a long way, especially at sunset in New York Harbor. 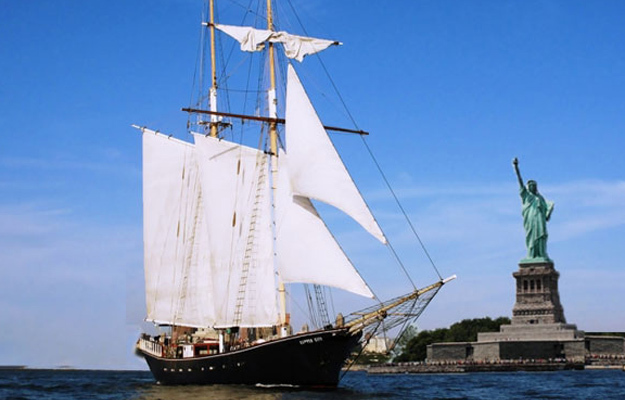 Watch the glowing sun setting behind the Statue of Liberty from a great vantage point on Manhattan by Sail’s Sunset Sail aboard the elegant schooner Shearwater or from under the giant sails of Clipper City Tall Ship Sunset Sail. 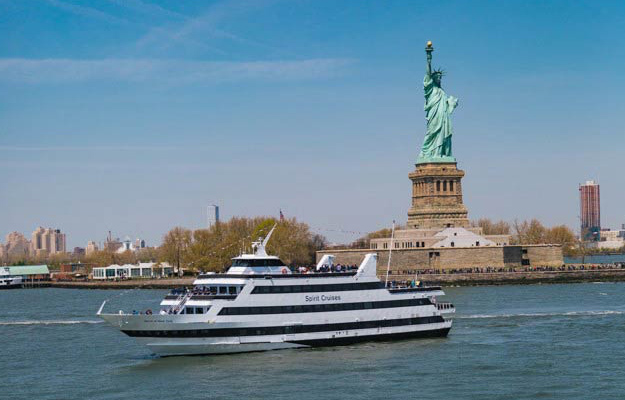 Circle Lines Harbor Lights Cruise is a good way to take the family to experience the magic of NYC’s signature skyline, the Statue of Liberty and the 3 bridges glowing and sparkling against the night sky. Food and beverages are available for purchase. SailwayNY’s Champagne Sunset Charter is about as romantic as it gets. Relax in the elegant luxury and sip champagne with no more than 12 guests, while sailing through the harbor surrounded by the skyline bathed in a golden glow. Departing at 4 and 6 pm, fur blankets and heated seats ward off the evening chill during cooler weather. Often called Booze Cruises, Happy Hour sails are adult summertime faves and a perfect way to kick off an evening in the city that never sleeps. Hornblower’s Alive after 5 is the mingling place where an on-board DJ spins the best tunes Thurs -Sun from 6-8 pm. Food and drink packages are available. Clipper City Tall Ship unfurls her gigantic sails at 5:30 pm for a festive Happy Hour on the Harbor. For adults, 21 and over, the seasonal sails end in September. Shearwater’s Happy Hour Cruise on Thursdays and Fridays at 5:30 May-August is a fun, laid-back experience. A DJ keeps the party going on Hornblower’s Rock the Yacht Cruise’s 2-hour party cruise year-round from 9-11 pm. Popular Craft Beer Tasting is a blast when it is done while cruising around New York Harbor on Clipper City Tall Ship. Seasonal, May-September, Saturdays and Sundays at noon. 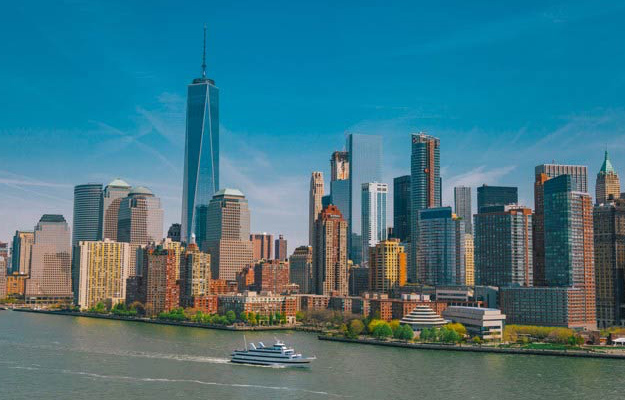 If your preference is wine, it’s s super-fun to cruise through New York Harbor while learning about and sampling great wines and cheese pairings on Shearwater’s Wine Tasting Cruise. SailawayNY’s luxury 2-hour Whiskey Tasting Luxury Sailing Yacht Tour is an elegant Whiskey sipping tour! Get your evening started on a 4pm, 6pm or 8pm sail as you take in the sights while sampling 6 locally distilled NY Whiskeys and munch on nuts, chocolates and seasonal fruit. Don’t worry about the night air chill. Heated seats and cozy fur blankets keep you comfortable. 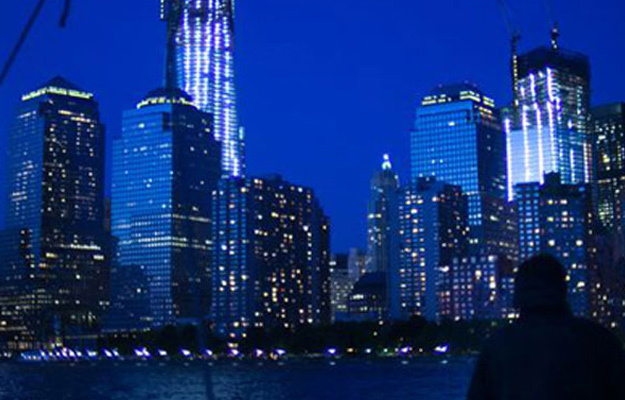 Combining a NY Harbor cruise with a delicious meal, elegant atmosphere, music and amazing views is a visitor favorite. New York Bateaux and Spirit of New York, both large, well-appointed, multi-level yachts holding several hundred guests, offer Lunch and Dinner Cruises with good music. Share a toast as your ship pushes away from its mooring, streamers flying, for a pleasant on-board experience. Stroll outdoor decks and look for iconic sights from the rails of outdoor decks. Step inside the comfort of spacious, climate-controlled interiors to be seated for a sumptuous buffet lunch or dinner as music spun by a DJ fills the room. 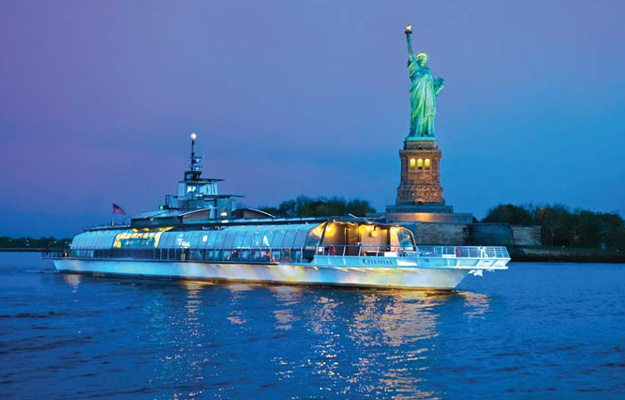 Hudson Dinner Cruise is a floating, elegant restaurant with spectacular 360 views. It’s the perfect evening: dine on a fabulous 4-course dinner aboard a 3-level yacht on a slow cruise on the Hudson River as lights come on throughout the Big Apple. Sunday Champagne Brunch is special when it’s on a sail around New York Harbor, taking in the fresh air and casually sophisticated ambiance of the sleek schooner Shearwater. Relax, sip Prosecco, take in amazing sights, enjoy a delicious brunch on the open deck. Luxury Yacht Manhattan Brunch Cruise combines a delightful buffet of smoked salmon, fruit, pastries, quiche and pastries and a cruise along the Upper West Side and under 3 bridges. Visibility from the climate-controlled salon and open back deck of the 1920s style luxury yacht are great. Sat. & Sun. mid-March to Dec. 29.